The earliest known record of any of the McDowells in the Americas was the son of a Col. William McDowall of Garthland who is mentioned in a will dated 19 September 1672 of William Dweare of Barbadoes (and of Calvert County, Maryland) and was probated on 29 August 1673. The MacDowalls of Garthland had several members who served the crown in the West Indies. Col. William MacDowall of the British Army, served in St. Christophers, West Indies, where he acquired a considerable plantation. He purchased the ancient barony of Castlesemple in the parish of Lochwinnoch, Renfrewshire, from the 11th Lord Sempill in 1727, and other baronies. Earliest McDowells of old Calvert County in Maryland, (c1670-90) probably descend from Col. William McDowall of Garthland and Castlesemple. James McDowell and Elizabeth McDowell of Ireland - the wife of the English Capt. Thomas Hardy, were recorded as living in the Isle of Wight, Virginia by the late 1600's. Another of the earliest McDowells in America was a Fergus McDowell, an “Irishman” and merchant in Stonington, Connecticut (settled in 1649). Fergus McDowell received a Power of Attorney from his father-in-law Ezekiel Cleasby of Boston, Massachusetts on 26 December, 1692. Stonington is on Long Island Sound, near present day New London and Groton, Connecticut and at that time was a busy early American seaport, a major shipbuilding and whaling center. Fergus may have required the power of attorney to facilitate his business dealings as a merchant. The record of Fergus' power of attorney is located in the Suffolk County registry of deeds. Fergus and his wife Mary Cleasby McDowell had at least three children, James McDowell, the son of Fergus and Mary, was recorded as living in Stonington, Connecticut in 1723. Fergus and Mary also had two daughters Anna and Mary, both of whom married into the Chesebrough family. Anna McDowell (born 1690) married Elihu Chesebrough (born 3 December 1668), the only son of Elisha (born 4 June 1637) and Rebecca Palmer Chesebrough. After Elihu's death in 1671, Anna married John Baldwin of New London on 24 July 1672. Elihu and William Chesebrough were descendants of the prominent Chesebrough family of England and early New England. Mary McDowell, another daughter of Fergus McDowell, was the second wife of William Chesebrough - married 13 December 1698. William was the son of Samuel Cheesbrough (born 1 April 1627), whose first wife Priscilla Alden was the granddaughter of John Alden of the Mayflower. Samuel was the grandson of a William (born abt 1594) and Ann Stevenson Cheesbrough (married 15 December 1620) of England and the son of Nathaniel Cheesbrough (born 4 April 1666) of Boston. William and Mary Cheesbrough had five children: William, David, Thomas, Abigail, and Mary. Anna McDowell Chesebrough Baldwin died in 1725 (age 35) and Mary McDowell Chesebrough died on 23 March 1744. The brothers Alexander, John, and William McDowell immigrated to America by 1718, perhaps as early as 1714-15. Both Alexander and John were described as mariners and surveyors in early Pennsylvania records. Alexander McDowell is listed as a land purchaser on Penn land along the Peapack on the Raritan in Somerset County, New Jersey along with the Pettinger and many Dutch families. Both John and Alexander are referred to as brothers in New Jersey, Pennsylvania, and Delaware records. By 1721, both John and Alexander owned property in New Castle County, Delaware. John McDowell of New Castle County, Delaware died in 1736. It is this John McDowell (Sr.) who was the father of Charles, Robert, William, and Joseph McDowell of Pennsylvania, Virginia, and North Carolina. Two other sons (James and John Jr.) died young in Pennsylvania. Son James' widow Mary, moved her family to join the brothers in North Carolina. John McDowell (Sr.)'s son Robert McDowell (b. 1709) joined John, Alexander, and William's brother Ephraim McDowell and family on their journey down to Virginia and received land headrights with them in 1737. (Ephraim having come later to America by 1731). Robert didn't stay in Virginia, but returned to Pennsylvania before finally joining his own brothers Charles, William, and Joseph (and brother James' widow Mary) in Anson County, North Carolina in 1750. Although brother Joseph received his grants in Anson County, North Carolina in 1750, he did not join his brothers there permanently until about 1762/63. The elder William (brother of John, Ephraim, and Alexander) and wife Mary Irvine McDowell first settled in Chester County, Pennsylvania before moving to Wright's Ferry on the Susquehanna River. William McDowell's son Col. John McDowell (b. c1715) of Peter's Township, Lancaster County, Pennsylvania built McDowell's Mill - famous in frontier history as McDowell's Fort near Bridgeport during the French & Indian War. The voyage of the George and Anne was even worse. This is the story of their terribly voyage. The passengers of the George and Anne were mostly friends and neighbors from County Longford in Northern Ireland, supplemented by a few last minute additions in Dublin. The organizer of the expedition was Mr. Charles Clinton. The passengers were nearly all free people who paid their own way to go to the land, which they perceived as offering a better opportunity. They intended to land in Pennsylvania but actually landed on Cape Cod - after a horrendous 4 ½ month voyage in which most of them perished. Mr. Clinton kept a journal (or diary) of the voyage, stating his journey began from the County of Longford on Friday the 9th day of May. He and his family arrived next at Dublin on the 12th and embarked on the George and Anne on the 18th, with the ship getting underway from Dublin on the 20th of May. On the River Liffey in Dublin, just above the O'Connell Street Bridge and about one mile from the ingress of the Irish Sea is where the George and Anne set sail for America. The ship next arrived at anchor at Glenarm (County Antrim) on the 24th, departing the next day. On the 26th, the ship came to anchor at Green Castle in the Lough of Foyle where it remained until the 29th of May, then set sail in the company of the John of Dublin, bound for Newcastle, Ireland. The ship caught sight of Loughsuly (Lough Swilly) on the 30th, and sailed past Tory Island and Hornhead, bound for America. The night of the 30th of May, a strong wind arose and continued through the evening of the 1st of June. The crew loosened the Bowsprit with Hazard of the Masts. On the 2nd of June, the ship caught a fair breeze and set a westerly course. Clinton's daughter Catherine and son James fell sick with the measles on the 3rd of June and this marks the beginning of that epidemic, according to Clinton's diary, which would claim the lives of many of the children on board. The winds continued westerly through the 5th of June, when the first child died. On the 7th the George and Anne, presumably still in company with the John of Dublin, met the ship Mary from Pennsylvania from which she had sailed in 5 weeks and 5 days. On the 8th of May, 1729, a child of James McDowell died and its body was committed to the deep. Two days later, the winds had come to East and were now Southerly, and turning more Easterly on the 11th. On the 12th of June, the winds blew North and East as a fresh gale by which the sailed 40 leagues in 20 hours and found that the ship was at position 49 degrees 20 minutes North Latitude by observation. During this point, addition passengers and their servants began dying a rate of at least one a day, with addition children becoming ill and succumbing to the measles epidemic. Conditions were beginning to deteriorate rapidly, with one instance of a servant throwing himself over the side and drowning. On the 17th of June, the winds came to the south and continued with a violent gale to the 18th driving the ship off its westerly course and further south. According to the ship's journal, on the 12th of June the George and Anne was on a direct northern course from Ireland to Pennsylvania, but by the 21st the reading puts them far south of the Azores in the region of the Canary Islands, off the northwest coast of Africa. This indicates that Captain Rhymer, the ship's master, was either incompetent of determining his position, or incompetent of maintaining his course. The stated position is well south in the Horse Latitudes, the area of the Atlantic where sailing ships risked laying motionless adrift, without benefit of wind for long periods. The ship was reported in the journal entry for the 21st in a perfect calm (no wind) at position 27 degrees 30 minutes North latitude. On the 28th of July, the winds turn favorable with a West by Northwest heading. The Journal continues recording the deaths of the passengers on board through 7 July including the death of another child of James McDowell on that date. Just two days prior they had sighted the Azores at 40 degrees 09 minutes North latitude, 32 degrees 33 minutes West longitude. On the 7th of July, Clinton's journal is no longer being kept and falls silent. By this time multiple deaths were occurring every day. Apparently there was a long hiatus in Clinton's journal (diary) from 7 July to 4 October. Prior to this point, Mr. Clinton lists 16 deaths. In the list that followed, he listed 78 deaths (some apparently duplicated from the first list). Perhaps Mr. Clinton was sick, or perhaps there was so much dissension and thoughts of mutiny on board that he was too busy to continue the diary during this hiatus period. In the later “Recapitulations”, it appears that a total of 80 or 85 died during the voyage. There was a measles epidemic on board, and probably some of the children succumbed to this. Also, in a 4 ½ month voyage, it was routine in those days for many to die of scurvy (lack of vitamin C). However, most of the deaths on this long voyage of the George and Anne were probably due to the incredible overcrowding and inevitable spoilage of food in 4 months, with intractable, epidemic, fatal diarrhea, and vomiting. For example, Christopher Columbus' Santa Maria (1492) was about the same size (100 tons gross weight, compared to 90 tons for the George and Anne) but carried only 50 people on its voyage of little more than two months (compared to an apparent load of 168 passengers plus an unknown number of crew on the George and Anne). As the George and Anne was a chartered ship, it was stuffed with as many passengers as possible to collect as many fares as possible. 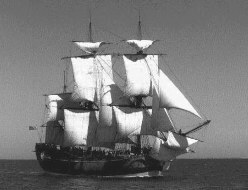 The ship finally reached land fall off the Continent of America on the 4th day of October, 1729 on Cape Cod. Some accounts indicate that the actual anchorage of the George and Anne in America was off Momoloy Island, of the county of Barnstable, Massachusetts. After wintering over there, many of the surviving passengers migrated to the Little Britain (Orange County) part of New York. This settlement was located on the western shore of the Hudson River about 60 miles north of New York City. “At last it was discovered by Col. Clinton that it was intentionally caused by the Captain, to starve out the passengers and lessen their number by death or otherwise, and thus possess himself of their money, of which there was considerable on board. The captain was seized, put in irons by the passengers, and the command given to the mate, who brought the ship in, in a few days." The accompanying ship John of Dublin presumably continued its voyage and arrived at the port of Philadelphia, Pennsylvania in 1729. Possibly on board the John of Dublin were possibly additional members of the McDowell family, as well as, related Campbells, Irvines, Mitchells, McElroys family members. Andrew McDowell (Sr.), of the George and Anne, lived for a time in Philadephia but eventually settled near Nottingham, Chester County, Pennsylvania where he was recruited as the Lt. Col. of the 2nd Pennsylvania Battalion of the Colonial Troops on 4 June 1759. Andrew was related in some close manner to the McDowells of Monmouth and Somerset Counties of New Jersey, including Alexander and John McDowell (d. 1736, later of New Castle County, Delaware). Andrew was also related in some manner to Ephraim McDowell of Virginia. A list of Andrew and his descendants (probably drawn from the pages from a family bible and written in the 1st person singular by Andrew McDowell) with names and birth/death dates can be found in the personal papers of Gov. James McDowell of Virginia, indicating a family connection to Ephraim's family. It is this author's contention that Andrew was most likely a son of Alexander McDowell who owned land on Peapack in Somerset County, New Jersey - and ancestor of the McDowells of Perth Amboy, New Jersey. This Alexander was a brother of Ephraim McDowell of Virginia and would explain the interest and connection to Ephraim and his descendants.